The Q7 is coming to the U.S. after being on sale for only three months in Germany, marking the shortest time span between European and U.S. launches in Audi's history. MORRISTOWN, NJ – Audi of America Inc. has more than 1,000 orders in the bank for its new Q7 cross/utility vehicle that goes on sale in June, an executive says. Every U.S. dealer will have at least one Q7 at launch, says Wolfgang Hoffman, director-product management. Audi also will provide each dealer with a demonstration vehicle, he says. But dealers will not be allowed to sell the demos for at least six months, because Audi will retain ownership of the units to ensure at least one Q7 is on display until the pipeline fills demand. The Q7 is built on a separate line in the same plant as the Volkswagen Touareg and the Porsche Cayenne in Bratislava, Slovakia. The V-8 engines for the Q7 are produced in Gyor, Hungary, and the V-6s come from Audi’s Salzgitter, Germany, plant. Audi is kicking off the launch with 10 regional programs it says will attract 25,000 attendees in New York, Chicago, Philadelphia, Atlanta, Miami, Dallas, San Diego, Los Angeles, Seattle and San Jose, CA. The Q7 is coming to the U.S. after being on sale for only three months in Germany, marking the shortest time span between European and U.S. launches in Audi’s history, Hoffman says. The Q7 is the most important model Audi has ever launched, says Johan de Nysschen, executive vice president in charge Audi of America. That may be arguable, but the Q7 is certainly the most important introduction of de Nysschen’s tenure as head of the importer. He arrived in Auburn Hills, MI, a year ago after heading Audi’s operations in Japan. Though he has a laser focus on increasing profits ahead of volume, the Q7 is poised to substantially increase Audi’s sales. The importer sold 83,066 vehicles in the U.S. in 2005, a 5.6% increase over 2004 and the second-highest annual volume for Audi in this market. Through April, Audi sales are up 5.2% on like-2005. De Nysschen declines to forecast Q7 volume either this year or for a full year, but he predicts the CUV will be one of Audi’s best-selling models. He expects utility vehicles to account for 25% of Audi sales in five years. Audi will kick off sales with the 4.2L V-8 model that has a top speed of 130 mph (209 km/h). The FSI V-8 is a detuned version of the mill used in the Audi RS4 sports sedan, but in that car it redlines to 8,200 rpm and makes 420 hp, while in the Q7 it tops out at 7,200 rpm and generates 350 hp. There’s also a difference in the way the oil is distributed in the Q7 V-8 to insure the engine gets enough lubrication when the vehicle is on steep slopes, where SUVs frequently are taken. Next year Audi will offer the same V-8 in the A6 and A8. 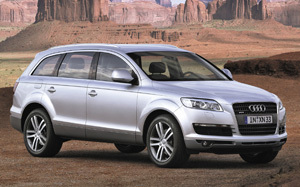 Later, Audi will distribute Q7s equipped with a 3.6L V-6. Hoffman expects the V-6 to capture 75% of sales and to net average transaction prices in the mid-$40,000 range. The vehicle will base at about $40,000. Hoffman predicts the average transaction price of the V-8 model will be in the high-$50,000 range. There also will be premium editions of both V-6 and V-8 models, which have few available options and are expected to sell for close to their suggested prices of about $50,000 and $60,000, respectively. Hoffman forecasts the premium edition will account for 90% of V-6 sales and half of all V-8 demand. Audi studies indicate 12%-15% of customers left the brand to buy SUVs in the past. Despite soaring fuel prices, De Nysschen says he doesn’t think Audi is getting into the segment too late, noting the luxury utility vehicle market continues to expand. De Nysschen notes that 85% of A3 buyers are newcomers to the brand, and he is confident the new Q7 will attract many customers who have not purchased Audis in the past.